Always take all children and pets with you or leave a responsible person with them: Leaving a child or a pet unattended in a parked vehicle is dangerous. In hot weather, temperatures inside a vehicle can become high enough to cause brain damage or even death. Always close all the windows, lock the doors and take the key with you when leaving your vehicle unattended: Leaving your vehicle unlocked is dangerous as children could lock themselves in a hot vehicle, which could result in death. Also, a vehicle left unlocked becomes an easy target for thieves and intruders. The vehicle lock-out prevention feature prevents you from locking yourself out of the vehicle. (European models) All doors and the liftgate/boot lid will automatically unlock if they are locked using the power door locks with any door open. If all the doors are closed even though the liftgate/boot lid is open, all the doors will lock. (Except European models) All doors and the liftgate/boot lid will automatically unlock if they are locked using the power door locks with any door or the liftgate open. 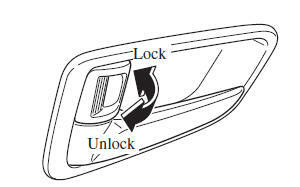 (Door unlock (control) system with collision detection) * This system automatically unlocks the doors in the event the vehicle is involved in an accident to allow passengers to get out of the vehicle immediately and prevent being trapped inside. While the ignition is switched ON and in the event the vehicle receives an impact strong enough to infl ate the air bags, all the doors are automatically unlocked after about 6 seconds have elapsed from the time of the accident. If door-related systems or the battery is malfunctioning, the doors will not unlock. All doors and the liftgate/boot lid lock automatically when the driver's door is locked using the key. They all unlock when the driver's door is unlocked using the key. Turn the key toward the front to lock, toward the back to unlock. The double locking system is designed to prevent someone who has broken into your vehicle from opening the door from the inside. If you have any problems with the double locking system, consult an expert repairer, we recommend an Authorised Mazda Repairer. Never activate the double locking system with passengers, especially children, still inside the vehicle: Activating the system with passengers, especially children, still inside the vehicle is dangerous. The passengers cannot open the doors from inside. They would be trapped and subjected to extreme temperatures. This could result in serious injuries or even death. Switch the ignition off and take the key with you. Close all doors and liftgate. 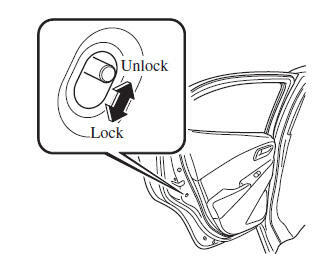 Insert the key in the driver's door, turn the key to the lock position, and return it to the centre position. Then turn it to the lock position again within 3 seconds. You can also activate the system by pressing the lock button on the transmitter twice within 3 seconds. (With the advanced keyless function) You can also activate the system by pressing the request switch twice within 3 seconds. The indicator light illuminates for about 3 seconds to indicate that the system has been activated. The system cannot be activated when any door or the liftgate is open. Unlock the driver's door or switch the ignition ON. If the power supply is interrupted (fuse blows or the battery is disconnected), the system can only be deactivated by unlocking a door with the key. All doors and the liftgate/boot lid can be locked/unlocked by pressing the request switch while the key is being carried. To lock the doors and the liftgate/boot lid, press the request switch and the hazard warning lights will fl ash once. (Except European models) A beep sound will be heard once. To unlock the doors and the liftgate/boot lid, press the request switch and the hazard warning lights will fl ash twice. (Except European models) A beep sound will be heard twice. Confi rm that all doors and the liftgate/boot lid are securely locked. For the liftgate/boot lid, move it without pressing the electric liftgate/ boot lid opener to verify that the liftgate/boot lid has not been left ajar. (European models) All doors and the liftgate/boot lid cannot be locked when any door is open. (Except European models) All doors and the liftgate/boot lid cannot be locked when any door or the liftgate is open. 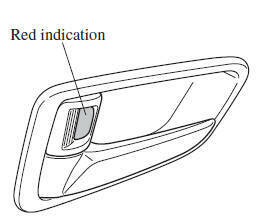 (European models) The setting can be changed so that a beep sound is heard for confi rmation when the doors and the liftgate/ boot lid are locked/unlocked using a request switch. (Except European models) A beep sound is heard for confi rmation when the doors and the liftgate/boot lid are locked/unlocked using the request switch. If you prefer, the beep sound can be turned off. The volume of the beep sound can also be changed. Refer to Personalisation Features on page 9-13 . (With double locking system) Pressing the request switch twice within 3 seconds will activate the double locking system. The setting can be changed so that the doors and the liftgate/boot lid are locked automatically without pressing the request switch. (Auto-lock function) A beep sound is heard when all doors and the liftgate are closed while the advanced key is being carried. All doors and the liftgate/ boot lid are locked automatically after about three seconds when the advanced key is out of the operational range. Also, the hazard warning lights fl ash once. (Even if the driver is in the operational range, all doors and the liftgate/boot lid are locked automatically after about 30 seconds.) 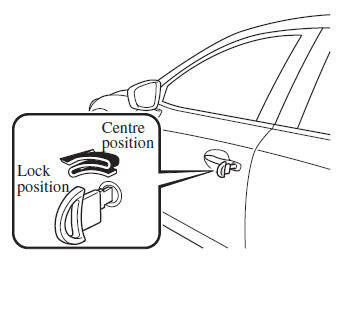 If you are out of the operational range before the doors and the liftgate/boot lid are completely closed or another key is left in the vehicle, the auto-lock function will not work. Always make sure that all doors and the liftgate/ boot lid are closed and locked before leaving the vehicle. The auto-lock function does not close the power windows. After unlocking with the request switch, all doors and the liftgate/boot lid will automatically lock if any of the following operations are not performed within about 30 seconds. Opening a door or the liftgate/boot lid. All doors and the liftgate/boot lid can be locked/unlocked by operating the keyless entry system transmitter, refer to Keyless Entry System (page 3-3 ). All doors and the liftgate/boot lid lock automatically when the lock side is pressed with all doors and the liftgate closed. They all unlock when the unlock side is pressed. The doors and the liftgate/boot lid cannot be locked while any other door or the liftgate is open. 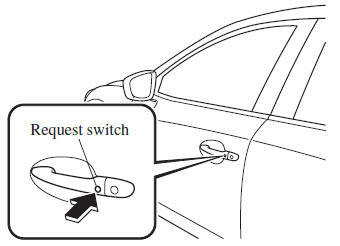 (With door-lock switch) Do not pull the inner handle on the driver's door: Pulling the inner handle on the door while the vehicle is moving is dangerous. The driver can fall out of the vehicle if the door opens accidentally , which could result in death or serious injury. (Without door-lock switch) Do not pull the inner handle on a front door: Pulling the inner handle on a front door while the vehicle is moving is dangerous. Passengers can fall out of the vehicle if the door opens accidentally , which could result in death or serious injury. When the vehicle speed exceeds 20 km/h (12 mph), all doors and the liftgate/boot lid lock automatically. When the ignition is switched off, all doors and the liftgate/boot lid unlock automatically. These functions can also be disabled so that they do not operate. The doors and the liftgate/boot lid can set to lock or unlock automatically by selecting any one of the functions from the following table and using the door-lock switch on the interior door panel. Function number 3 is the factory setting for your vehicle. There are only a total of six auto lock/unlock settings available for automatic transaxle vehicles, and three for manual transaxle vehicles. Be sure to press the unlock side of the driver's door-lock switch the correct number of times according to the selected function number. If the switch is mistakenly pressed seven times on an automatic transaxle vehicle or four times on a manual transaxle, the procedure will be cancelled. If this occurs, start the procedure from the beginning. 1 The auto door-lock function is disabled. 2 All the doors and the liftgate/boot lid lock automatically when the vehicle speed is about 20 km/h (12 mph) or more. 3 All the doors and the liftgate/boot lid lock automatically when the vehicle speed is about 20 km/h (12 mph) or more. All the doors and theliftgate/ boot lid unlock when the ignition is switched from ON to Off. 4 (Automatic transaxle vehicles only) When the ignition is switched ON and the shift lever is shifted from park (P) to any other gear position, all the doors and the liftgate/boot lid lock automatically. 5 (Automatic transaxle vehicles only) When the ignition is switched ON and the shift lever is shifted from park (P) to any other gear position, all the doors and the liftgate/boot lid lock automatically. When the shift lever is shifted to park (P) while the ignition is switched ON, all the doorsliftgate/boot lid unlock automatically. 6 (Automatic transaxle vehicles only) All the doors and the liftgate/boot lid lock automatically when the vehicle speed is about 20 km/h (12 mph) or more. When the shift lever is shifted to park (P) while the ignition is switched ON, all the doors liftgate/boot lid unlock automatically. *1 Other settings for the auto door lock function are available at an expert repairer, we recommend an Authorised Mazda Repairer. For details consult an expert repairer, we recommend an Authorised Mazda Repairer. Refer to Personalisation Features on page 9-13 . Settings can be changed using the following procedure. Safely park the vehicle. All doors must remain closed. 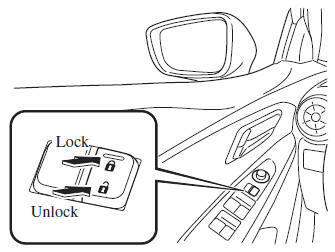 Press and hold the lock side of the driver's door-lock switch within 20 seconds of switching the ignition ON, and make sure a beep sound is heard about eight seconds afterwards. 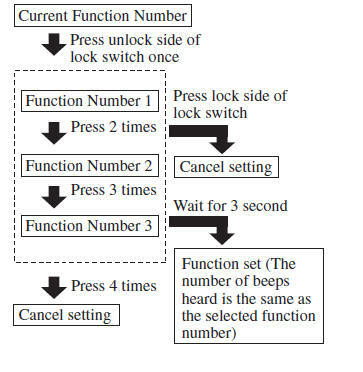 Refer to the auto lock/unlock function setting table, determine the function number for the desired setting. 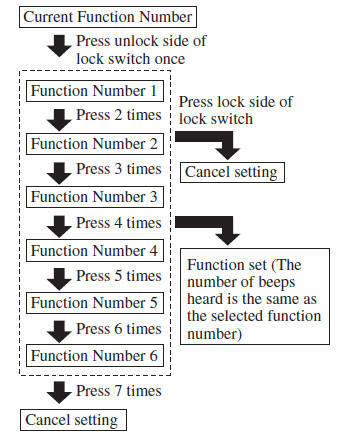 Press the unlock side of the driver's door-lock switch the same number of times as the selected function number (Ex. If you select function 2, press the unlock side of the switch only 2 times). The doors cannot be locked or unlocked while the setting function is being performed. The procedure can be cancelled by pressing the lock side of the doorlock switch. (With door-lock switch) To lock any door from the inside, press the door-lock knob. To unlock, pull it outward. This does not operate the other door locks. (Without door-lock switch) All doors and the liftgate/boot lid lock automatically when the driver's door-lock knob is pressed. They all unlock when the driver's door-lock knob is pulled out. The red indication can be seen when the door-lock knob is unlocked. 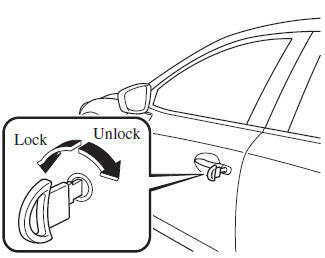 To lock the rear and front passenger doors with the door-lock knob from the outside, press the door-lock knob to the lock position and close the door (holding the door handle in the open position is not required). 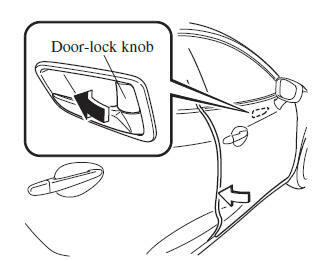 The driver's door lock knob cannot be used while the driver's door is open. These locks are intended to help prevent children from accidentally opening the rear doors. Use them on both rear doors whenever a child rides in the rear seat of the vehicle. If you slide the child safety lock to the lock position before closing that door, the door cannot be opened from the inside. The door can only be opened by pulling the outside handle.